Hostile Sky is a depiction of the final flight of Victor Chapman, the first US airman to lose his life in combat. Chapman, a member of the famed Lafayette Escadrille was flying his Nieuport 16 on June 23, 1916, on a personal errand to deliver a crate of oranges to a hospitalized friend. While in the air he noticed a dogfight in which he recognized three of his squadron mates. Chapman joined to the fight only to find that his squadron mates had vanished and that he was now alone against five German Fokker monoplanes. The fight ended quickly with Chapman plummeting to his death. 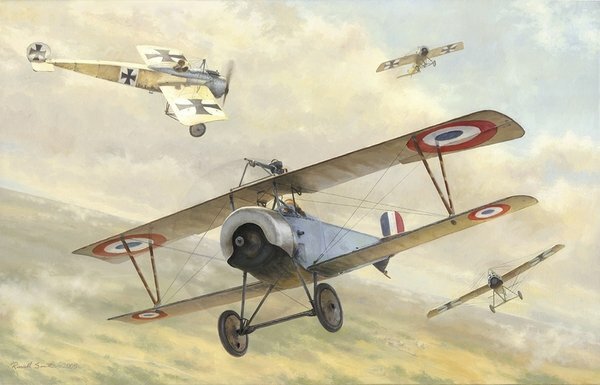 The original design of this piece featured Chapman’s Nieuport with a brown and olive paint scheme which was common to the Escadrille at that time. However, after work was begun on the painting a fellow WW1 researcher turned up some vital information regarding the paint scheme of Chapman’s aircraft. A report made by one of Chapman’s squadron mates indicated that the reason his comrades deserted him during the fight was that only a few days prior he had painted his aircraft sky blue. The new color scheme of his aircraft blended with the sky, thus his friends never noticed him enter the fight. Printed on acid free rag paper, the edition consists of 200 prints, each of which is signed and numbered by Russell Smith.